Enter for your chance to win a pair of tickets to attend Ed Sheeran: Jumpers for Goalposts here. If you don’t win, don’t fret! Tickets are available to purchase now. See you there! Special Fathom Features: Experience Ed Sheeran on the big screen captured live via satellite from London’s famed Odeon Leicester Square, plus an exclusive performance and red carpet premiere. 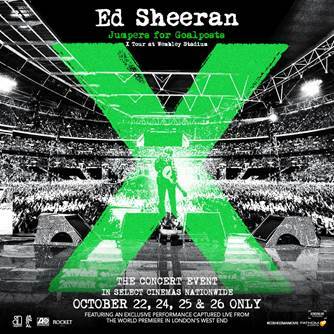 Fathom Events and ScreenLive are thrilled to bring the incredible concert documentary, Ed Sheeran: Jumpers for Goalposts, to the big screen nationwide for a special four-day event on October 22, October 24, October 25, and October 26. Captured live in London, Ed Sheeran: Jumpers for Goalposts gives audiences an exclusive look at the man behind the guitar and will feature red carpet footage from Odeon Leicester Square and a recorded-live 30-minute performance from Ed.